A native of North Carolina, Kathy Sawyer has been fortunate to have lived on the coast since 1977. Kathy’s real estate career began in 1985 in Emerald Isle. Her time there was brief because a golden opportunity arose to move to the Outer Banks in 1987. Kathy has actively brokered real estate for 34 years. She is a graduate of North Carolina Realtor’s Institute. Along with her GRI designation, she has the Short Sale and Foreclosure Specialist designation. She has sold properties from $20,000 for a buildable lot to $2,950,000 for a Pine Island estate. 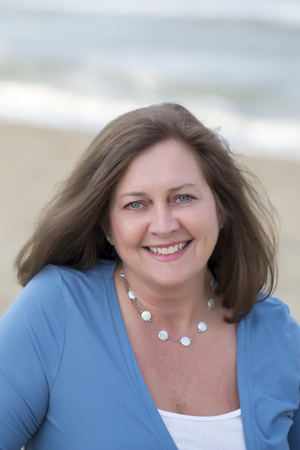 She thrives on the opportunity to sell or list property in and around the Outer Banks area, and takes pride making happy buyers become happy homeowners and taking sellers to their next destination. She has received many sales awards during her selling career. In her spare time, she enjoys cooking, gardening, and bicycling. Kathy has a deep love of dogs and enjoys walking her pups, Zack and Summer. She loves to visit Charleston, SC, the Bahamas, the Virgin Islands, Aruba, and the British West Indies—not to mention the Hawaiian Islands as well. Just going to the beach anywhere with blue water and white sandy beaches makes her day. Kathy lives with her husband, Jeff Sawyer, a local home designer and owner of Sea Swept Design. She also has a son, Matthew, a senior at NC State who will graduate in the spring of 2019 with an engineering degree. Kathy’s one-year-old granddaughter, Lilly Jane Sawyer, resides in Virginia Beach.